Over the last few years,conservation bodies have been very fascist regarding so called alien species. We used to have at least two native species of deer the roe (Capriolus capriolus), and the Red deer (Cervus elaphus).The roe,has been common since the turn of the last century, as before it was rare in many parts of England due to the past laws and the deer removal act, so for over a hundred years the species only held on in more remote areas. Dorset was a stronghold and is responsible for harbouring the species allowing recolonization later to many other parts of Southern England.It has since been very common in the county whilst the red deer became extinct as a wild species outside the New forest. Before the second world war, red deer were still common in Purbeck and grazed the natural heathlands. There were not many natural predators to keep them healthy, but hunting humans finished them off along with loss of habitat. There was a gap of time without herd deer in Purbeck, but small herds of fallow deer ( Dama dama) existed. These herds are now few and far between. the japanese sika deer (Cervus japonicus) filled the gap after nineteen hundred and have since been the main herd deer within Purbeck. 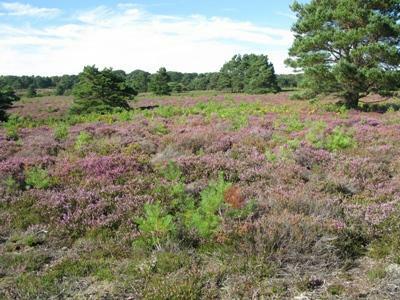 they did a grand job in keeping the heaths open, and as they grew in numbers the heaths became very species rich with insects feeding on them and their droppings boosting the bio diversity. The sika rarely overgrazed and in most areas where there are or were, huge herds the heath wasn’t overgrazed but managed and where the herds prevailed, the birds and reptiles flourished in a way that was natural. the heath became alive and one could walk within grazed areas and be overwhelmed by the sheer abundance of insect life.In the wake of the sika explosion, the few big cats that found there way to Purbeck had what seemed to be a natural feeding area full of life. the cats bred and every few years several young cats would move out to other areas from this perfect fatherland. There was a constant turnover of young animals moving out to populate other areas where large cats did not exist or were thin on the ground. The cats bred as there needs to be large herds to sustain a mother and two or three offspring. One individual large cat such as a puma or a leopard will kill one large or adult deer a week. this is the norm.so the herds need to be large enough to cater for a number of these animals. When the herds have been unnaturally shrunk by humans, then the cats suffer and they have poor breeding seasons. Now the British conservation bodies have waged war on alien species, the cats will suffer and problems may occur due to the fact that there is an elimination programme regarding sika deer. surely one does not need to be a rocket scientist to see what the problem could be.since all types of people have been killing whole herds of deer, there have also been more reports of pet dogs and cats going missing, and many sheep and cattle are being killed and eaten by large cats who would normally eat the deer. this is not all, in fact there have been several human fatalities in the past and this may get worse if the conservation bodies do not take the big cat phenomenon seriously, and write them into the equation. No conservation works unless one knows what species there are in any area and what effect they have on the environment. As most people do not believe that there are at least three species of large cat living wild in Britain then not a lot is going to change. Matters could become more serious. Although large cats need large animals such as deer they can adapt without them, but then other species will be at risk, and especially livestock. One of my main research area has had a clamp down of wild deer, Japanese sika deer. this is or was the principle food item for pumas and leopards within this area. now the deer have been eliminated causing the heaths to cover over with pine trees. It is so sad to see a working thriving ecosystem fall apart because of miss management. The conservation bodies are failing due to their uneducated stance on big cats. This is what the Arne nature reserve now looks like. the heath is covered with small sapling pines about three years old. Without deer grazing the heath, many species of insects will disappear and that will have a knock on effect for the reptiles and birds. Where money is involved it seems people will do anything, and grazing heavy marauding cattle gives conservation bodies money from Europe. Many barbed wire fences have gone up causing distress and injury to wild deer and other mammals and birds.Deer need to move around and so do the cats.I am now finding more large cat scats with rabbit and bird remains in rather than deer. There needs to be balance and respect.